Dr. Govindaiah joined Springfield Clinic's Allergy, Asthma & Immunology Department in September of 2006. She is board certified in allergy and immunology and internal medicine. She completed her residency and fellowship training at the University of Michigan and received her medical degree from Northeastern Ohio University School of Medicine. 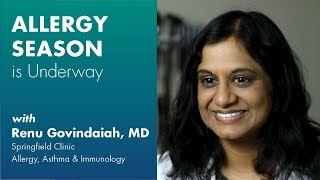 She is a member of the American College of Allergy, Asthma and Immunology. Prior to joining Springfield Clinic, Dr. Govindaiah worked as a general internist at the Ann Arbor Veterans Administration Hospital for one year and worked in a group allergy practice in Lansing, Mich. for two years.